Oops - we don't appear to have a video for the ScanJet Enterprise Flow 5000 s3. Send scanned files where you need them - directly to cloud storage or SharePoint. File size matters - ensure files are saved with size in mind - automatically compress large files. Straighten out your paper shuffle - transform hard copies into easy-to-use files. Look sharp by producing clear,legible scans at up to 600-dpi resolution. 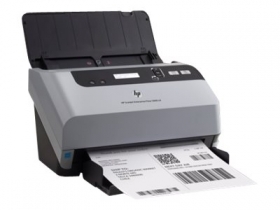 Save time and simplify complex scan jobs with HP Smart Document Scan Software. Fits in around the office - preserve workspace with a compact scanner designed to fit your floor plan. Create one-touch scanning efficiency by assigning your favorite settings to a single button. IT time and effort,saved - simplify deployments,installations,and event alerts. Accurately capture the right content,using auto-scan mode,crop,and color detection. Full speed ahead - breeze through sheet after sheet at speeds of up to 30 pages and 60 images per minute. Count on this workhorse to deliver again and again with a design that can handle up to 4,000 pages per day. Spend energy wisely - this scanner turns off automatically when it's not needed to help reduce energy costs.